Sanjushree can't easily hide the fact that she once had leprosy. Her gnarled hands and toes display the effects of a 40-year battle with the disease. The 100-year-old woman remembers the day it began. Sanjushree was 9 when she first noticed her fingers had started to curl inward. She didn't understand why—neither did her parents or the doctors or the witch doctors they visited in search of the answer. Years passed, and the young girl's fingers didn't straighten out. Embarrassed by her disfigurement, Sanjushree kept to herself, interacting only when necessary. There were times when she traveled with the village midwife, watching and learning how to help pregnant women deliver their babies. But beyond that, she tried to separate herself from the community, afraid others might catch whatever it was that was crippling her fingers. When Sanjushree was 22, she married and eventually had two daughters. Five years after her marriage, skin lesions appeared on Sanjushree's body. That's when she knew it was leprosy. Her husband stood by her, continuing to love her; so did her children. There were some in her community who became fearful and cut off all contact with the young woman. But others didn't let the stigma of leprosy interfere with their friendship, choosing instead to see Sanjushree as the kind woman who had once helped them deliver their children. As Sanjushree's body suffered with the lesions, her heart ached with the emotional pain the leprosy caused. She wasn't sure what to do, but she was determined to continue on with her life. While her husband worked as a carpenter, she worked by making brooms and cane baskets, catching and selling fish, and farming. She didn't let her gnarled fingers or the other symptoms of leprosy keep her from helping provide for her family. But for three years, the heartache remained. One day, a carpenter friend told her about a nearby church that had a small hospital where people with all sorts of health problems were treated. For the first time in years, Sanjushree found a reason to hope and began to believe she might actually find healing. It was here where 30-year-old Sanjushree first heard about Jesus. Doctors treated her and then sent her to another small hospital that was connected to a church. As Sanjushree attended the church, she learned more and more about Jesus. She discovered He could heal people afflicted with leprosy—and a deep faith took root in her heart. She knew, without a doubt, Jesus could heal her, and she depended on it. Throughout the following year, she grew in intimacy with the Lord as the pastor taught her from God's Word. Even though she was illiterate and couldn't read the Word herself, she engraved what she heard in her mind. When her husband died a year later, her trust in Jesus sustained her. Sanjushree continued to trust and wait on God to heal her for 20 more years. Finally, when she was 50 years old, she experienced the healing she had prayed and longed for! Filled with overflowing joy, Sanjushree decided she wanted to spend the rest of her life helping others who were suffering with sickness. 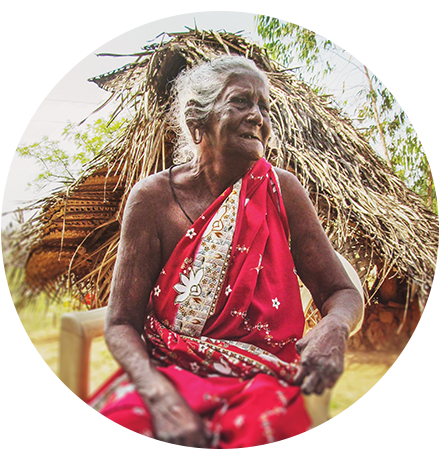 Able to understand their affliction and heartache like few others could, Sanjushree spent the next 50 years praying for those who were ill. She'd share with them about her own struggle with leprosy and about God's miraculous healing and love in her life—and the Lord used her. God freed people suffering from spiritual oppression or various sicknesses after Sanjushree prayed for them. She eventually joined a church led by a GFA-supported pastor where the pastor and the Women's Fellowship have been a source of encouragement and help to her. It was here, too, where she learned more about sharing the Good News with others. "I was touched by [Sanjushree's] love for the Lord," says Julia, the regional Women's Fellowship leader. "Our pastor . . . said that every week when she comes to church, she will bring at least one person to the church. That is her passion for the Lord! I am so amazed by the boldness she has. She doesn't fear anyone. … When we asked [her] how she is able to do all these things, she replied, 'I am like a lion. When Jesus is with me, why should I fear anything?'" 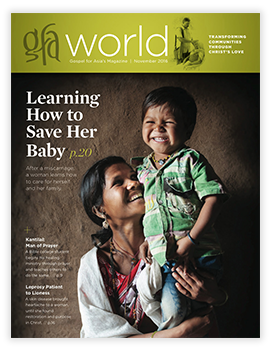 Through her boldness, God has used 100-year-old Sanjushree to show people His saving grace as she travels to different places, praying for people, helping with childbirth deliveries and proclaiming the excellencies of Him who healed her.